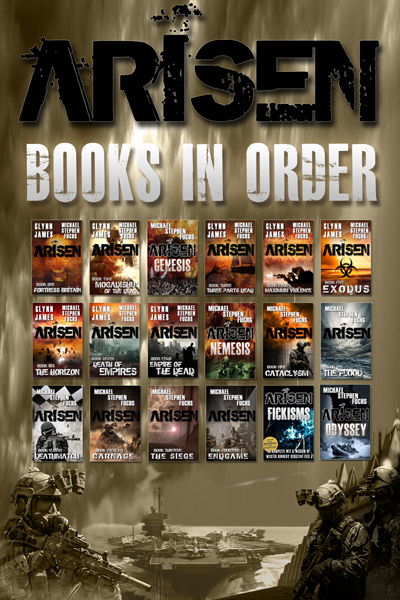 As the blurbs above suggest, the ARISEN series enjoys a level of fan loyalty and fervor that has resulted in sales of over half a million copies and over 5,000 Amazon reviews averaging 4.7 stars out of 5. (Including a 4.9-star average for each of the last two books in the series, The Siege and ENDGAME. This is rather hard to maintain. Basically, if one grumpy person puts up a 2-star review, I need thirty 5-star reviews just to cancel it out!) Additionally, the audiobook editions (narrated by the incomparable R.C. Bray) have generated over $3 million in revenue, and the series is in various slow-motion negotiations for a film, TV, or miniseries deal. (News on that to you when I get it!) There are also two new books in the works  ARISEN : Raiders (about the MARSOC Marines on the Kennedy from the Fall through the final battle with Spetsnaz… yes, including MGySgt Fick) and ARISEN : Operators (about all the special operations forces at Hereford between the Fall and the final battle at CentCom… yes, including Alpha team)  so it should be a pretty amazing year for ARISEN fans.